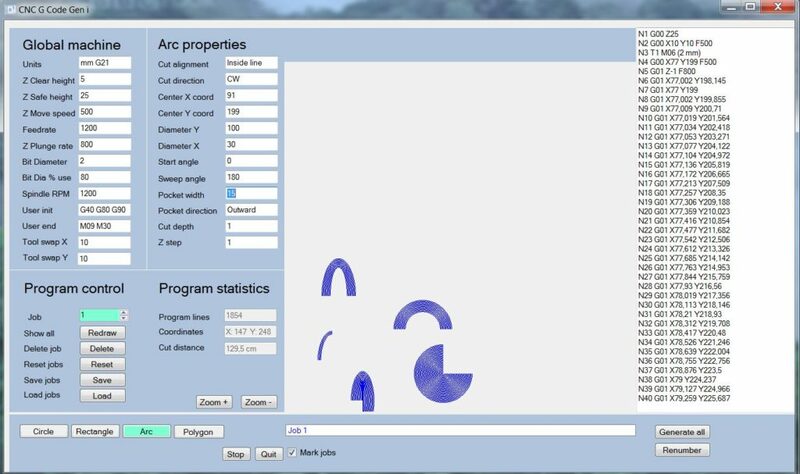 Here you will find the CNC G Code Generator Arc variant of the program. The G Code is compiled in real time after every change, ie text box inputs and dragging with the mouse. G Code is automatically copied to the computer clipboard and can be pasted into a simulator or milling machine directly after every change. All Jobs can be dragged with the mouse and are selected by mouse movement over them. Here is some sample code in metric, and under that it is in inch. Both versions are 32 bit for maximum compatibility. The program may have bugs as it is impossible to test the G Code for every conceivable setup, so please check your code by doing air cuts or running it in a simulator beforehand. Here is a link to an introductory video. There is no spyware whatsoever in my software and it only goes online to check for updates.